The San Francisco Museum of Modern Art’s monthly series SFMOMA Artcasts, coproduced with Bay Area audio experts Antenna Audio, Inc., explores current issues and ideas in modern and contemporary art. While we are still honing the program, we have learned quite a bit over the last six months about what makes a successful podcast. We have preliminary answers to some questions. What is the best use of this new medium? Is a podcast just a traditional audio tour in a new guise? If not, how is it different? How does its distribution model facilitate communication? How can it be used to initiate dialogue with younger audiences? What are the institution-wide challenges of launching a new – and, for some, completely unfamiliar – means of delivering content? Using SFMOMA's experience as a case study, this paper offers insights into the challenges of producing content in-house versus outsourcing the task to professionals. It also examines the Museum's use of podcasts as a way of inviting artists, musicians, writers, and the general public to submit their own content, addressing the hurdles associated with bringing what was initially considered a “guerrilla” medium into a curatorially sanctioned space. A hybrid of the terms iPod and broadcasting, podcasting has been touted as a revolutionary mechanism for distributing content directly from provider to client – specifically, for serving audio, video, and other media files directly from a podcast creator’s Web site or blog to a subscriber’s mobile device or personal computer. Unlike streaming files or direct downloads, which offer a single source of content on a one-time basis, podcasts allow users to subscribe to many content streams simultaneously via feed-reading programs called aggregators. As new files become available, listeners are notified automatically; depending on their preferences, subscribers can opt to have the new content transferred directly to their computers or mobile devices or to download files selectively at their leisure. The Internet’s own form of ‘pirate radio,’ podcasts have proliferated organically and broken from the polished conventions of mainstream radio, leveling the playing field between ‘outsider’ and ‘sanctioned’ content providers. Inexpensive software and freeware such as GarageBand, Propaganda, and Audacity have simplified the editing process, enabling people with limited resources to post their own podcast ‘shows.’ The resulting podcasts are often characterized as much by their irreverence and homemade production values as by their delivery mechanism. Today a diverse community of podcasters flourishes on the Web, still bound by a tacit understanding that content should be shared freely – in both the democratic and monetary sense. A new genre of programming has been born. 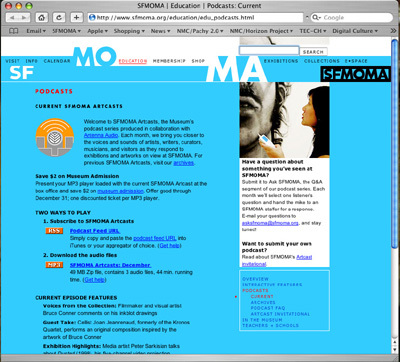 The SFMOMA Interactive Educational Technologies team began exploring podcasts in the summer of 2005. We started slowly, with our first podcast comprising a curatorial exhibition tour that parroted the classic audio guide format (September: The Art of Richard Tuttle). Our next podcast was a more generalized tour that enhanced the visitor experience with audio recordings of an artist’s writings (October: Robert Adams: Turning Back, A Photographic Journal of Re-exploration). From there we developed an audio “zine,” copublished with Antenna Audio, that contained multiple short features and one longer exhibition tour (SFMOMA Artcasts: November-present). Faced with the task of illuminating an ambitious but visually puzzling exhibition, IET’s first foray into podcasting took a straightforward and didactic approach. Armed with a new Marantz digital audio recorder and microphone, the IET team tagged along as SFMOMA curator Madeleine Grynsztejn led a staff tour of The Art of Richard Tuttle in July 2005. It seemed like a good idea at the time. We thought it would be a relatively simple matter of editing the recording and posting it to the Web, serving up Grynsztejn’s insightful commentary for the remaining three months of the show’s run. 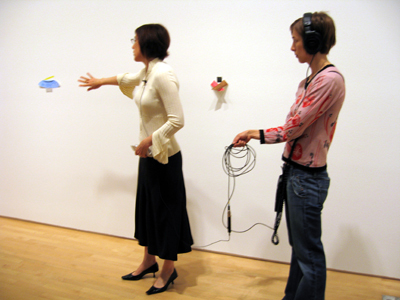 Fig 1: IET producer Tana Johnson, right, trails curator Madeleine Grynsztejn on a staff walk-through of the exhibition The Art of Richard Tuttle, July 2005. That said, in its first weekend alone the podcast was downloaded more than 250 times, confirming the Museum’s belief that an audience existed for educational podcasting. For our second podcast, we decided to depart from the standard exhibition tour audio guide format. Rather than tying ourselves slavishly to specific artworks in the Robert Adams exhibition, we asked the artist’s permission to quote from his writings and hired an actor to read the excerpts. This provided for Adams’s photography an overall introduction that visitors to the exhibition could absorb even as they looked at the individual pictures. It worked rather well, though questions of whether to accompany the soundtrack with images and how to signal the presence of changing images without making visitors think they should be standing in front of the work that appeared onscreen led us to make the tour audio-only. The other milestone in this podcast was the inclusion of background soundscapes recorded in the field, contributed by Steven Dye and Jefre Cantu, two sound artists on the Museum’s staff. Despite our use of scripts for this second podcast (the initial, unscripted podcast having proved so problematic), the podcast took many hours to edit, and we could see that our lack of audio training was putting a crimp in our overall productivity. Up to this point we had produced the podcasts exclusively in-house. The process had been labor-intensive and a moderate success. But we had been in talks with Antenna Audio, which is based in nearby Sausalito, since the early summer. The people there, too, were interested in exploring the podcast phenomenon and gaining a better understanding of its implications for their future: Was it an opportunity or a threat? Would it make every museum self-sufficient, giving away audio tours for free, or would it make every museum a potential client who might hire an audio production firm to deliver podcasts? The answers to those questions are still uncertain, but SFMOMA and Antenna Audio agreed to a developmental partnership in this case to help each other determine what might be the most interesting aspects of this new medium for museums. The twenty to thirty exhibitions and thousands of artworks presented in the Museum’s galleries each year offer a constantly changing, multi-threaded parade of objects, perceptions, and ideas. The general public only hears about a handful of headliner exhibitions, but the informality and flexibility of podcasts allows us to bring to the fore more of the fascinating and provocative ideas at play in the Museum at any given moment. The portability of the microphone is a powerful way to convene a creative community. The Artcasts’ Vox Pop feature opens the door to myriad public voices that offer unrehearsed, casual observations. The Guest Takes feature allows us to invite guest artists – such as performer and composer Joan Jeanrenaud, sound artist Pamela Z, and writer JT LeRoy – to share their creative responses to specific artworks, exhibitions, or the museum experience. Finally, our Artcast Invitational gives the general public the opportunity to submit carefully composed, standalone contributions. Like a magazine editor, we assemble cultural features that point at the Museum as an ever-changing resource and destination. Some features are of-the-moment, while others can be drawn from relevant resources in our content archive. The portable nature of iPods and other MP3 players makes them equally suited to inject art into the everyday lives of listeners and to bring listeners back into the Museum, where they can listen to audio commentaries in the presence of the artworks that inspired them. SFMOMA agreed to provide audio of artists discussing works on display and a ‘bonus track’ exhibition tour for each podcast. Antenna, meanwhile, agreed to record the host narration and Vox Pop and to do the final editing and sound design of the zine portion of each Artcast. The result, loosely modeled as a National Public Radio-style audio zine, brings listeners the voices of “people who have something interesting and insightful to say about the art that’s on view here at the Museum” (SFMOMA Artcast, 2005). While curatorial walkthroughs are invaluable as didactic tools, they nevertheless feature one-way flow of information from the inside of the institution out. How can future podcasts engage the community beyond the Museum’s walls? Can we invite the participation of outside voices and still maintain a level of professionalism that respects the scholarship and care curators bring to researching and developing our exhibitions? Do we want to embrace the guerrilla production values of many early podcasts, or is it important to maintain a level of polish that both our on-site and virtual visitors have come to expect of our multimedia presentations? How much editing will be done in-house and how much will be outsourced to a more experienced but costly production company? Can we learn from such a company? Given the IET team’s limited staff and budget, plus an already full plate of project deliverables, how sustainable is our ambitious monthly podcast goal? And with no built-in financial benefit to the Museum, how will the team justify its podcast program to the institution? SFMOMA delivered videos to gallery-based Personal Digital Assistants five years ago, and it has developed rich media broadband presentations using Flash and video; Antenna produced successful implementations of handhelds for Tate Modern and the Van Gogh Museum. What stands to be gained from embracing podcasting, a new version of an audio-only medium? What unique opportunities does it offer? Will podcasts undermine the market for paid audio tours, costing money to produce and cutting into an established revenue stream? Or can the two audio models coexist in different niches, one free and the other purchased? Six months later, we have provisional answers to these questions. But first, let us take a step back to review the podcasting phenomenon, which is but one expression of technology-induced changes in the broader cultural environment. Predictions for growth in the nascent podcast industry are equally astounding. As projected by Bridge Ratings LLC, a market data and audience measurement service for radio, “by 2010 podcast audience growth is expected to reach a conservative 45 million users. … Aggressive estimates place this number closer to 75 million by this date.” (Bridge Ratings, 2005) Clearly, podcasting is no longer a fad, but a major player in the mainstream media mix. Today’s online teens live in a world filled with self-authored, customized, and on-demand content. …The Internet and digital publishing technologies have given them tools to create, remix, and share content on a scale that had previously only been accessible to the professional gatekeepers of broadcast, print, and recorded media outlets. Given the ubiquity of content creation hardware and teens’ familiarity with content manipulation, it seems natural that museums should look to podcasting as an unprecedented opportunity for more effectively reaching out to a wider and younger audience. The history of automated audio tours goes back five decades to the primitive reel-to-reel players of the 1950s. Since then, the audio tour has become a fixture and default learning tool in museums and cultural heritage sites around the world. As audio technologies have evolved, so have the nature and tone of the audio tour. The cumbersome players of the earliest incarnations have given way to generations of ever more portable alternatives – from audiocassette players to handheld devices to wands and MP3 players that can be used with one hand. Random-access technologies have given visitors more control over their routes and the pacing of their gallery visits. Visual interfaces and hard buttons now allow visitors manual navigation through rich content (Schwarzer, 2001), while advances in wireless technologies, infrared tags, and GPS include location-sensitive triggers for content (Proctor, 2005) so visitors scarcely need to navigate at all. As advances in technology have changed the way users interact with audio tours, the content of the tours themselves has undergone a transformation. Inventive scripting has replaced the dusty, uninspired monologues of the earliest tours. Historically New York-based Acoustiguide and Sausalito, California-based Antenna Audio have dominated the American museum market; both now have outposts around the world, reflecting their omnipresence in the museum interpretive marketplace. The advent of podcasts and cell phone-based audio tours has created an opportunity for museums to produce tours and audio content on their own, while raising the question of what that content will sound like. Will visitors like these new home-grown tours more, or less? Many patrons enjoy personal audio tours for the privacy they afford – the freedom to move through the galleries at a self-determined pace without the intervention of a human guide. While these tours are popular with visitors, managing them is a major undertaking for the institutions that choose to use them. Once in place, the proprietary audio devices require constant maintenance, updates, recharging, and replacement – services typically supplied by a single vendor to which the museum is beholden. The vendors, with their enormous stake in hardware and infrastructure, are at risk, as well, in an environment of constantly evolving technology. In recent years, numerous museums have made forays into location-based PDA technology. In these cases, the visitors’ learning curve for unfamiliar devices becomes an issue. Due to the experimental and unpredictable performance of location-based systems, the risk of latency, bugs, and malfunctions is high. The visitors’ expectations pose another concern for developers: Accustomed to powerful personal computers with high-speed Internet access, visitors often have high standards for technology and little patience for systems that don’t work perfectly. Podcasts historically skew to the left of this chart, but as public interest in the medium grows and more energy, dollars, and major media efforts are poured into producing podcast content, the tone is beginning to shift toward the right. The collaboration has proven fruitful. Working with a creative outside vendor who “thinks audio” has helped SFMOMA define a podcast identity that we’re comfortable delivering on a regular basis. Each SFMOMA Artcast comprises two parts delivered in two files: an on-line audio zine for listening at home or on the go about town and an exhibition tour for use in the Museum. We aim for a total length of fifteen minutes for the zine: individual segments within it typically run two to four minutes. (There have been exceptions: JT LeRoy’s guest contribution clocked in at nearly nine minutes.) The second component – the ‘bonus’ track – is typically a loosely structured exhibition tour in the featured artist’s own voice. This feature can run longer than the zine segments – as long as fifteen minutes; we prefer to err on the side of excess, based on the assumption that visitors will want to linger longer with the art in the gallery if the artist is there with them. As for workload, the structure we have established provides a division of responsibilities for each episode. SFMOMA supplies the artist interview content and produces the bonus exhibition tour; Antenna’s senior producer Catherine Girardeau sews together transcript fragments so that our interview segments sound seamless and flow elegantly into each other. She also records the connecting narration, adds background sound design, and produces the Vox Pop segment. We are learning audio production skills, but we also value the years of production expertise a seasoned producer-engineer like Girardeau brings to our product. Visitors will be able to bring in their iPods and synchronize them to a docking station in the Museum lobby, and then use their own hardware for an audio tour. Podcasts behave the same way as audio tours and can supplant them at a fraction of the cost. Many museums have launched their podcast programs by repurposing content they already own. New York’s Museum of Modern Art uses its podcast feed to distribute its pre-existing audio tour stops over the Web at no charge – certainly a noble gesture, but subscribers receive unaltered Acoustiguide materials which include stop numbers and instructions for using the Acoustiguide hardware (e.g., “If you need instructions on using this Acoustiguide, press 101, then press play.”) Without the visual interface of the Acoustiguide hardware, these instructions can be confusing, particularly to older listeners. Ironically, in some ways podcast tours take us back to the early days of cassette-based audio guides. iPods are linear delivery systems. Some readers might remember when the museum tour guide would ask each visitor to stop or pause the Walkman and then resume next to a specific artwork in the next gallery. Random access digital tours did away with all that: Audio was delivered in succinct, object-specific chunks. Most MP3 players, including iPods, are not equipped with a graphical interface, creating a challenge for audio tours that are traditionally navigated through a graphical menu or by punching in number codes. With iPods, which deliver audio that naturally flows from one track to the next, visitors must be vigilant about glancing down at the navigational screen so they can stop at the narration’s break point and restart when they are physically repositioned and ready to listen to the next message. The clickwheel technologies of MP3 players necessitate a rethinking of how podcast audio tours should be presented. Since iPods play MP3 files, they are compatible with each other and all MP3 players, regardless of the generation. One drawback of relying on the users’ own hardware is the potential for incongruity between players. Even within a single hardware type, such as the iPod, there exist multiple generations. Some older models may or may not be compatible with M4As, the standard for enhanced podcasts that include images and chapters. And Apple’s GarageBand 3.0, its purpose-built authoring tool for enhanced podcasts, outputs .ACC files that non-iPod MP3 players and Windows computers might not recognize. Vodcasts, or video podcasts use a variant of QuickTime with a compression scheme and aspect ratio that is unlike anything found elsewhere on either Mac or PC. 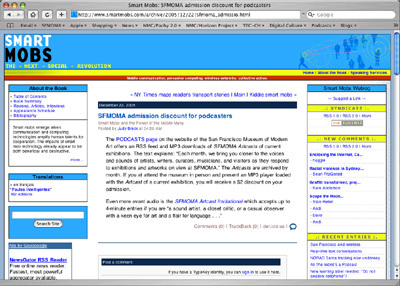 At SFMOMA, we have published both MP3 (audio only) and M4A (enhanced) podcasts, but we have stopped short of offering video versions until the installed user base is larger. We no longer need to hire an audio tour production company because podcasts lower the bar so much that we can produce our own. This is not entirely a myth: a museum can theoretically produce an iPod-based tour with in-house expertise and offer it over the Web or in the museum lobby. But the caveats mentioned in Nos. 2 and 3 above apply: the Museum must supply the hardware or risk catering only to those who have pre-loaded the current podcast and brought their own players, and, more important, the iPod clickwheel interface is both too sophisticated and not sophisticated enough to serve as an ideal object-by-object audio tour delivery system. (See also “Loss of the Graphical Interface” below.) At SFMOMA, we have come to the conclusion that podcasts are better treated as portable zines and facilitators of inter-arts dialogue than as audio tour replacements. When we do append exhibition tours to our Artcasts, they are typically general overviews for exhibitions that otherwise would have no audio enrichment. We increasingly avoid an object-by-object approach because of the problematic navigation, and we are quite conscious of the discrepancy in production values between our home-grown content and that produced by a professional firm. With all of this in mind, it is easy to understand why we consider podcasting in some ways a step backward from the media-rich interactive Flash and video features that populate our kiosks and Web site. Perhaps the biggest compromise is the lack of a graphical user interface, or GUI – something PDAs have, for all their flaws. Users are constrained to refer to a thumbnail image of an artwork (originally conceived of as ‘album art’ for downloaded tunes); if they click twice on the hub of the iPod clickwheel, the image enlarges briefly to a still inadequate size, then reverts to the thumbnail. The Touch and Listen interface Antenna has successfully piloted on the Tate Modern and Van Gogh Museum multimedia tours invites gallery visitors to point to a zone on an artwork and hear messages about it, and offers a more direct and intuitive experience (see Fig. 2). The iPod has no comparable feature. Fig. 2 The Tate Modern’s Multimedia Tour. The visitor touches a square on the PDA screen to trigger an audio message about that aspect of the artwork on view. Furthermore, publicity in the mainstream media is fine, but it is also important to tap alternative, ‘viral,’ channels: blogs, e-mails, and Web sites. Podcasts have introduced SFMOMA to a totally new paradigm for spreading information. The ‘Blogsphere’ is far more effective in promoting this medium than are traditional press releases or expensive print advertisements. In this digitally driven community, influential blogs such as SmartMobs, Anna Conti, and BlendedEDU spread word of our podcast project (fig. 4). These Web sites were then extensively reblogged so that within a matter of days our podcasts were listed in no fewer than thirty locations on the Web. Downloads and subscriptions went up commensurately. Where will content live in a hardware-agnostic world? What will it sound like? With the popularity of podcasting and the proliferation of freeware tools like GarageBand and Audacity, how will companies like Antenna Audio and Acoustiguide adjust their profit models? What happens to these companies when the hardware infrastructure belongs to the audience and they no longer have the hardware rental profits as a source of income? How do their profit models change? At SFMOMA, we use podcasts to open up a space for multiple voices: artists, curators, special guests, and audience members. Traditional audio tours theoretically offer this, too, but they tend to exclude the visitors’ nonarchival, noncuratorial voices. Podcasts foster a two-way communication between museum and community: iPods are a vector for injecting art ideas into the daily lives of people at home or on-the-go. The opposite is also true: iPods are a way of bringing voices from the community into the Museum. Are the typologies we’ve articulated followed by other museums, or have the experiences of other museums diverged from us? Let’s look at some other approaches. Museums wondering how they might integrate podcasting in their arts curricula may find some inspiration in what is happening on college campuses. A psychology professor at the University of Connecticut is recording small group study sessions and making them available to students to use in reviewing course content. The professor has recorded more than a dozen weekly study sessions. Students can download the podcasts to their own MP3 players or listen to the study sessions on computers. Students like the portability of the podcasts and the fact that they can stop the devices in order to take notes or to review a difficult idea. Duke University distributed free iPods to all 1,600 of its first-year students in 2004, but for the current academic year the university has modified the program to provide free iPods only to undergraduates who enrolled in a course that required the device. As professors have become comfortable with the technology, its use has expanded beyond foreign languages and computer science to engineering, dance, medical physics, biomedical engineering, and mathematics. Duke professors are using iPods to distribute course content, to record classroom and fieldwork audio data, and as a study support tool. In fall 2005 Purdue University launched BoilerCast, podcasts of classroom lectures from some seventy-five courses. Stanford University offers a wide variety of podcasts that can be downloaded from Apple’s iTunes Music Store. Stanford’s podcasting effort includes lectures, speeches, interviews, music, and sports, as well as curriculum materials created by professors for specific classes. The Victoria & Albert Museum (V&A) in London has teamed with Tyne & Wear Museums, Birmingham Museum and Art Gallery, and Brighton & Hove Museums to create a project called Every Object Tells A Story. According to the project’s Web site (http://www.everyobject.net/), the EOTAS stories/podcasts are “bite-sized accounts ... of people’s stories about objects they treasure. The podcasts, unlike the archived stories, are all personal stories by experts (so far).” An image of the artwork being discussed is displayed on the iPod or MP3 player while the story plays. Users may download a PDF ‘trail’ map highlighting the location of EOTAS objects in the galleries. The Victoria & Albert Museum has gone a step farther by developing a curriculum around its EOTAS project. The Hirshhorn splits its podcasts into Artist Lecture Series, Artist Interview Series, and Curatorial Walk-through Series. The podcasts feature long conversations with artists including Janet Cardiff, Ann Hamilton, and Jim Hodges. The San Jose Museum of Art’s Visual Politics: The Art of Engagement exhibition podcast matches commentary on social activist artworks with archival audio from historical and contemporary events. The authors wish to thank their colleagues who have actively participated in development of the podcast program: Tana Johnson, Tim Svenonius, Dana Mitroff, and Andrew Delaney at SFMOMA; Amy Heibel and Catherine Girardeau at Antenna Audio; and all the artists and guest artists who have been such willing and fruitful collaborators. Heibel, Amy (2006). E-mail correspondence to Peter Samis. January 25, 2006. Kennedy, Randy (2005). “With Irreverence and an iPod, Recreating the Museum Tour.” The New York Times. May 28, 2005. Maynard, Margy (2006). Personal communication re: test implementation of podcast tours in the Art of Engagement, San Jose Museum of Art. February 2, 2006. Moss, Karen (2006). Personal communication re: test implementation of podcast tours, Orange County Museum of Art. February 1, 2006. Nickerson, Matthew (2006). All The World's a Museum: Access to Cultural Heritage Audio Anywhere, Anytime. In Xavier Perrot (Ed.) Digital Culture and Heritage: Proceedings of ICHIM 2006 (CD-ROM). Paris: Bibliothèque Nationale de France. Proctor, Nancy (2005). Off-Base or On Target? Pros and Cons of wireless and location-aware applications in the museum. In ICHIM 2005: Wireless and Location-based Technologies in Museums. Presented at ICHIM 2005 Conference. September 8, 2005. San Francisco Museum of Modern Art (2005). Visitor Survey Reports. Internal document. Updated December 2005, consulted January 10, 2006. Sayre, Scott (2006). Personal communication re: mobile learning devices, February 4, 2006. Wilson, William (1996). ‘Taking Pictures’ Offers Few Bright Spots in a Mixed Bag. Los Angeles Times, April 2, 1996.